flat screen TV with XFINITY, and high speed wireless internet. 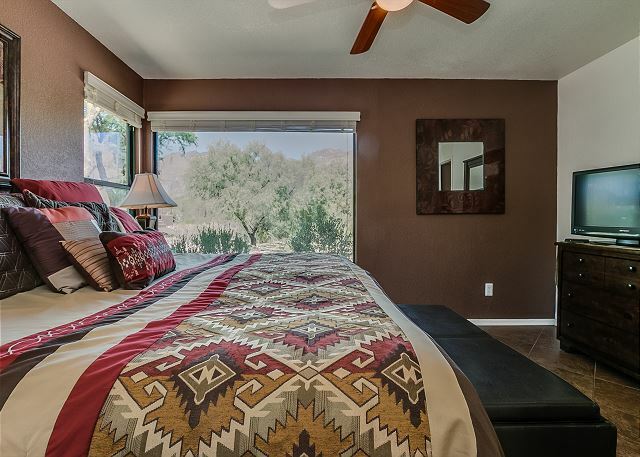 The master bedroom features a huge picture window with mountain views, a NEW Sterns & Foster king size bed, 32” flat screen TV, walk-in closet, and a master bath with a glass walk-in travertine tile shower. 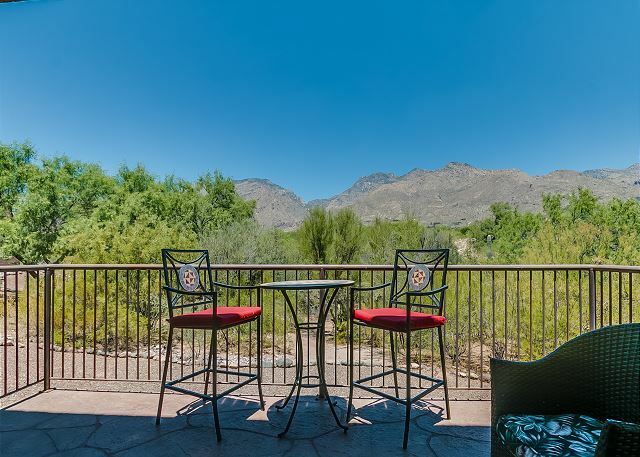 Great setting for a stay near the mountains north of Tucson proper. Quiet unit at the backside of the condo complex but close to pool. Stayed here with another couple and plenty of room. Loved watching the play of light each day on the hills from the patio. Well equipped kitchen made eating in a viable option. A full service grocery store and restaurants just half a mile away was quite convenient. Highly recommend this for longer stays in the Tucson area. For our family of five, including two married couples, this place was perfect. Plus, we were just over a mile to our parents' house, easy driving to hiking in Ventana and Sabino, and not far from grocery shopping, and the excellent El Charro restaurant. The kitchen is not set up for real cooking, but had just what we needed for breakfasts. 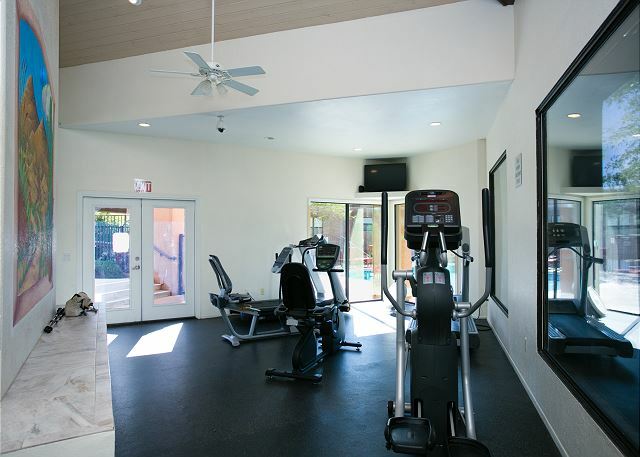 We also enjoyed the pool (steps away) and fitness center (across the street--limited, but sufficient). This was our 4th stay in a little over 3 years, and another one is planned in 6 months. Firstly, the staff: friendly, helpful, and make fine efforts to match condo selection to desires. Professional and experienced. Grounds throughout are attractive and beautifully maintained, including in our area a large pool and adjacent in-ground hot tub/spa. 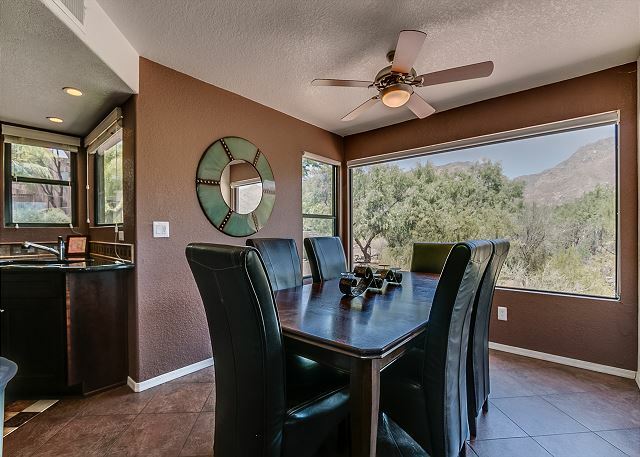 Both condos (3 BR 3 times, 2 BR once) we rented had well-equipped kitchens and 2 full bathrooms. 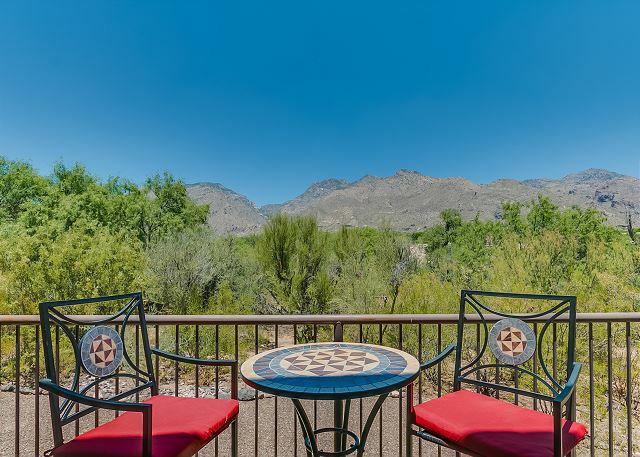 Great desert edge setting and view of the Catalina Mountains. Calm and serene. Ample parking, covered and reserved for each unit, and additional uncovered for guests. Excellent free wi-fi. Shopping complexes for groceries, drug store and restaurants a 2-minute drive. 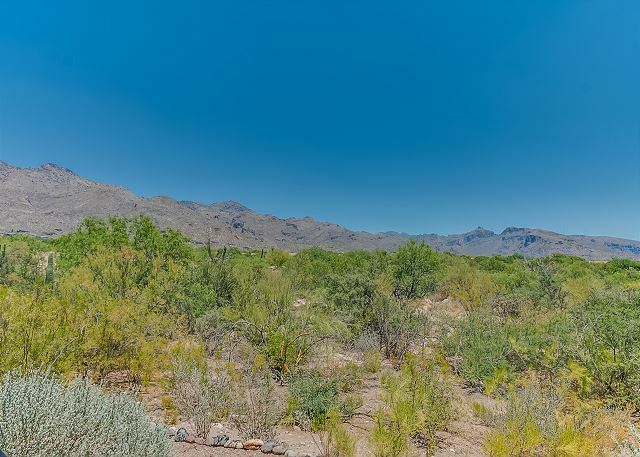 Easy access to general Tucson and surrounding area. Why on earth would we return? Hopefully obvious! 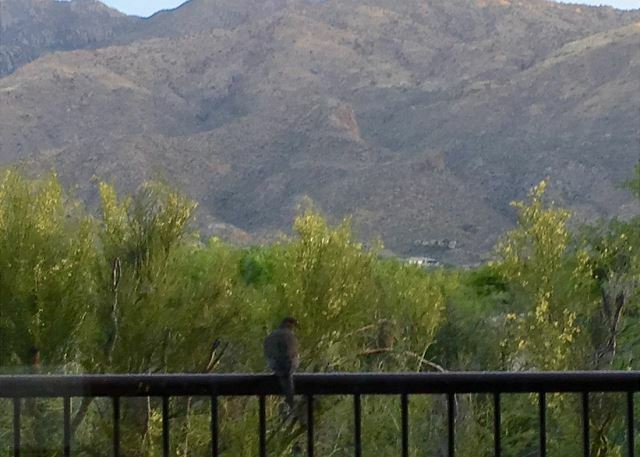 We had a great stay at Ventana Canyon! Amazing view right from the patio! We are a family of 6 and had plenty of room inside. The description and pictures were accurate and we found the condo nice and clean. The property and pool are well maintained. We used the facility computer and needed the printer and needed help to get online. We were not able to figure out how to get the printer to work, though. The maintenance crew were friendly. We would recommend this property to others. Our condo was right next to the pool, that was nice. We found most attractions in the area within 30 minutes or so, Saguaro National Park, Trail Dust Town, Downtown Tucson. Plenty of restaurants, shopping, and gas nearby; some well known chains and some unique to the area. Basha's grocery store was right down the street, good for any food needs, and has Starbucks coffee inside. We thoroughly enjoyed the condo and Tuscon! They did some parking lot maintenance our last 2 days there, a bit inconvenient because we couldn't use our assigned covered parking spot and had a hard time finding a place to park. This condo is gorgeous! 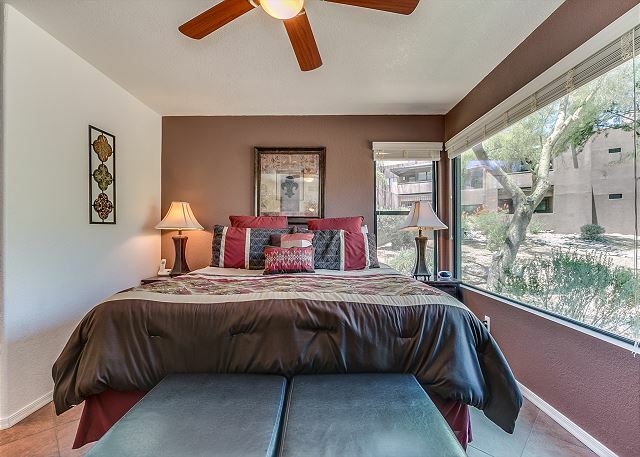 It has everything, views, next to the pool, beautiful furnishing, close to shopping, restaurants and Sabino Canyon. The staff was super also. We will definitely be back! Overall a wonderful week. Spent time with my sister and her family and went to her daughter's graduation. Spent an evening with high school classmates at a great Chinese restaurant. Loved the Blue Willow restaurant, went there twice. Also went to Lil'Abners. Had breakfast at the LaPaloma resort with friends. Other than my mother getting sick and having to spend one day in the ER I'd have to say we will most definitely rent at this location again. We had a wonderful time at the condo in Tucson, AZ. Plenty of room at the condo and conveniently situated for all of our outdoor adventures yet urban enough for play and shopping. Million dollar view for peanuts! You just can't beat the price for this incredible 3 bedroom beauty. Very well maintained and appointed - you won't be disappointed. 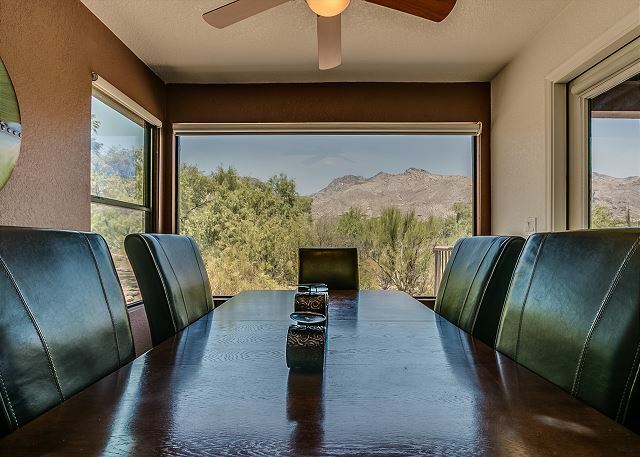 The location is great - it is like you have your own private view of the Catalina mts. You are also just steps from the pool. Terrific value! The property ngt. company is ver accommodating and easy to work with as well. We recently travelled to Tucson for a family wedding. Because our children and grandchild were travelling with us we decided that a condo would be a better option than hotel rooms. We loved Ventana Greens. The unit we rented was clean and well appointed and the grounds were very well kept. We would definitely stay there again. I almost hesitate to give this place a good review because I want to keep it a secret! 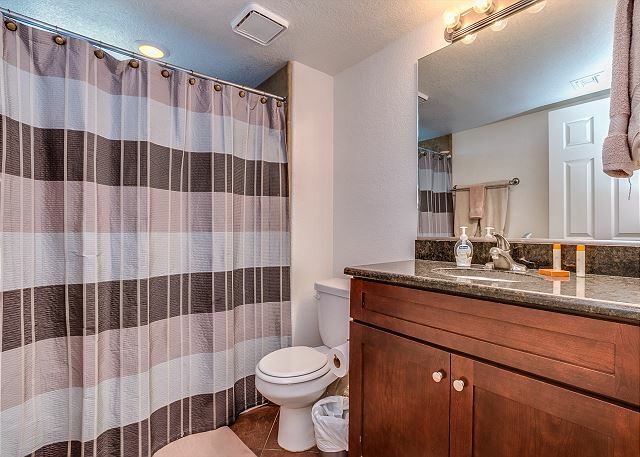 This condo is even nicer than the photos show. We had a fabulous time in Tucson and would definitely stay here again! 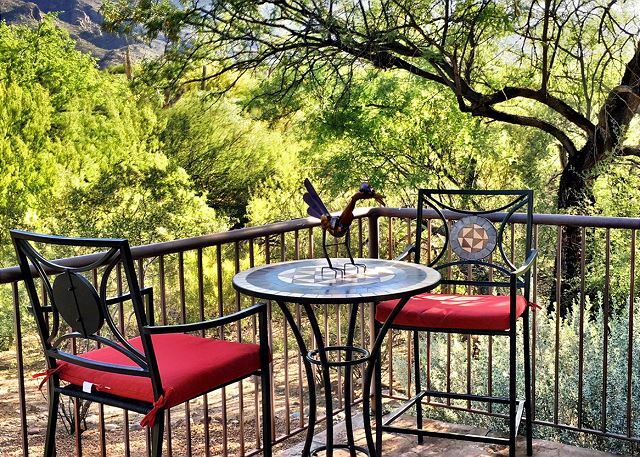 This was our second stay at the Greens at Ventana Canyon in 2014, the first being one week in a 2-bedroom ground-level condo in early June. 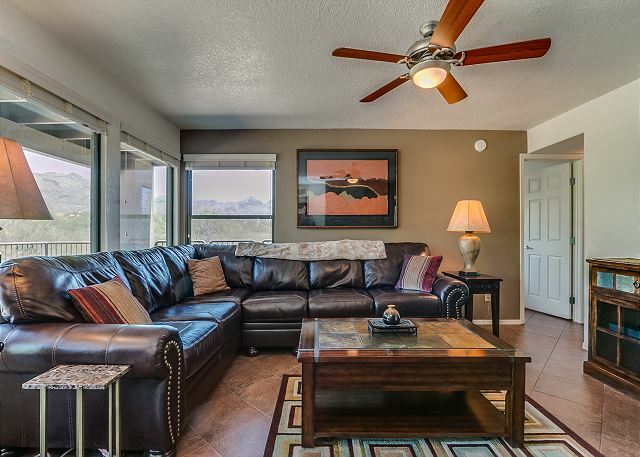 This time we chose a larger 3-bedroom ground-level unit in the fall for 8 weeks to accommodate visiting relatives. 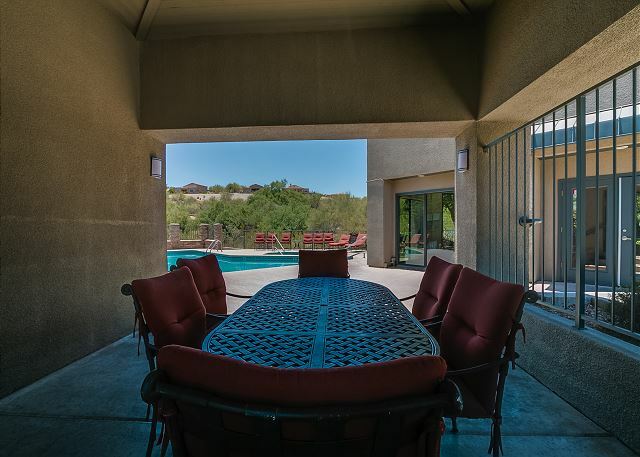 It was an excellent choice for size, layout, furnishings and well-equipped kitchen, TV reception and free wi-fi, mountain and desert view, patio and proximity to the pool and hot tub, and a quiet and relatively private location. 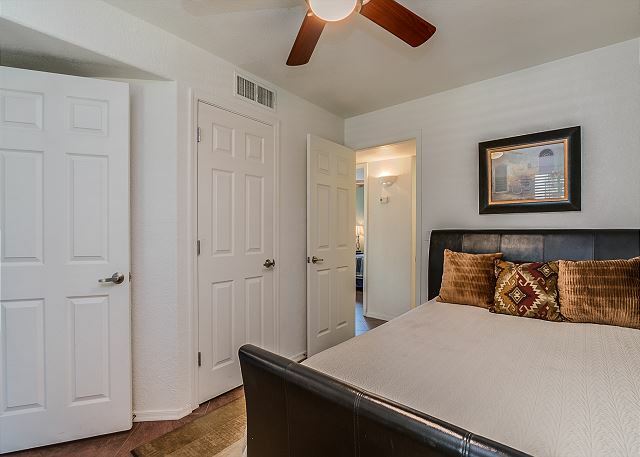 Notable overall were: the high standard of cleanliness and maintenance in the units; excellent groundskeeping including heated pool and in-ground hot tub care; designated convenient covered parking and ample parking for guests; and a pleasant, helpful and professional on-site property management team. The location, being in the northeast of the Tucson area, was convenient for access to venues and shopping throughout the valley, and away from congestion. Modest shopping centres with restaurants, pharmacies, a large grocery store and other amenities were about a 12+/-minute walk for those so inclined (or a 2 minute drive). Will we return? Absolutely, availability permitting! It was a lovely vacation in a great place and with a great view, an excelent appartment and recreational areas (pool and BBQ) very clean. The only one thing is that the beds are starting to get loose, hope they can be replaced with new mattress. 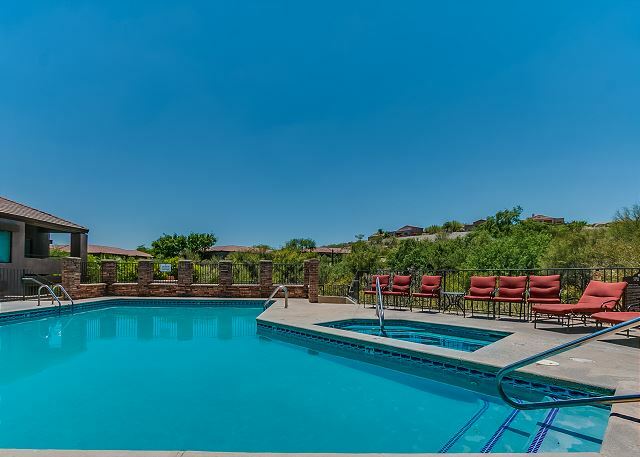 The Greens at Ventana is a great vacation experience and Spectrum makes the rental experience a breeze.